BANK ROD AV: 4 fish per angler. SPORT: A very windy day again here at Stocks with bright conditions to boot. It seems that if you got it right today the sport was exceptional. Regular Nigel Percival had a great day with 10 fish to the net. Nigel found a white fritz gold head the top pattern and Bell point was the spot to be. Also on Bell point was Colin Linsell who just piped Nigel with 11 fish. Collin fished cat’s whiskers and Cormorants on a slow sinking line to tempt the fish. Often these windy days can feel daunting and not fill you with much confidence, but if you use the wind to your advantage you can find the fish. Let the wind do the work bringing the flies round and you will be surprised just how close in the fish will be. Windy for tomorrow then settling off for the rest of the week. This entry was posted in Stocks Reservoir Fishing Reports on April 30, 2012 by Ben Dobson. BANK ROD AV: 4.0 fish per angler. BOAT ROD AV: 3.0 fish per angler. SPORT: Strong cold north easterly winds have made the fishing a little trickery today than it has been of late. However this said there have been some impressive catches in these tricky conditions. Out on the water today we had Stock’s resident guild Paul Bebb fishing with John and Tracey Watson. John and Tracey landed 10 trout between them fishing with an intermediate line with a booby on the point a buzzer on the middle dropper and a blob on the top dropper; they contacted most of their fish around Phil’s flats. Another boat doing well around Phil’s Flats was Paul Davison and Ryan Feber who had 14 fish to the boat, Paul pulled with boobies and dabblers to take 11 of their fish while Ryan opted to fish with the nymphs all day. Another angler who did well off the boats today in these challenging conditions was Mr Turner who had 9 fish all falling to nymphs fished around the northern shallows on an intermediate line. On the bank today Dave Flitcroft had a great days sport with 9 fish all falling to various lures and boobies fished on a intermediate line. Another angler who had a good days sport on the bank was Brendan Grinty who had 7 fish from a Bell Point on a black blob and other lures again fished on an intermediate line. The key today seemed to be persistence with the fish being very tightly shoaled so you could have a quiet period followed by 3 fish in 3 casts so just keep moving until you find the fish. This entry was posted in Stocks Reservoir Fishing Reports on April 28, 2012 by Ben Dobson. NOTABLE CATCH: Adam Alabaster 18 fish, Ben Bayliss 18 fish, George Ashton 10 fish, Paul Davison 13 fish loads more bag limits! BANK ROD AV: 4.6 fish per angler. BOAT ROD AV: 5.2 fish per angler. Today we hosted the CSSC North West region fly fishing heat. 21 anglers took to the water and landed a total of 78 fish, with not one blank for the whole day! 3rd place was had by Alan Turner with 7 fish for 15lb 14oz, Alan found the fish deep picking his up on a DI7 line with boobies. 2nd place was Phil Coultard with 8 fish for 15lb 15oz. Phil had his his fish up in the water with black and green boobies and little diawl bachs filling his bass bag. 1st place on the day was grabbed by George Ashton who had 10 fish for 21lb 9oz! A clear winner and a well-deserved victory. George found that a white and green nomad kept his rod bent all day long! Paul Davison and Derek Moore had a cracking days sport on dries. Paul took 13 fish in total 11 of which fell to dry flies. Although the highlight of the day came when he was washing lining diawl bachs with a small size 14 booby on the point. Paul turned to Derek and said ‘I don’t feel confident with this method, I think I’ll go back on dries’. No sooner had the words left his mouth and his line tightened and started to rip through his fingers. The fish literally went berserk; it left the water several times, fully cartwheeling through the air. Paul said ‘every time I regained my fly line from the backing it was off again’. ‘I bet it took my backing out 9 or 10 times before I could get it under any sort of control’. In his words ‘It was the best fight I’ve ever had from a fish!’ When Paul finally landed it the big rainbow tipped the scales to 13lbs 8oz. It was fin perfect (see picture below). What a way to christen his new Hanak reservoir rod! Adam Alabaster and Ben Bayliss put in an absolute cricket score today with 36 fish to the boat! Fished short little drifts intot the east bank both guys caught over and over again on their little secret olive pattern. Amongst the fish, Adam had a rainbow around 12lb! The key to success was to target the rising the fish and pull quickly past their noses. On the droppers little diawl bachs were picking up the odd fish or two. Some amazing sport today, Stocks is fishing amazing at the moment and the sport seems to be getting better and better! Adam Larbalestier caught this stunning 12lb rainbow on a small damsel in Blackhouse Bay. It should be noted that Adam is built like a barn door so he makes fish look smaller. Paul Davison caught the fish of the day whilst washing lining. It took a size 14 booby on the point. It put up a monumental fight. This entry was posted in Stocks Reservoir Fishing Reports on April 27, 2012 by Ben Dobson. 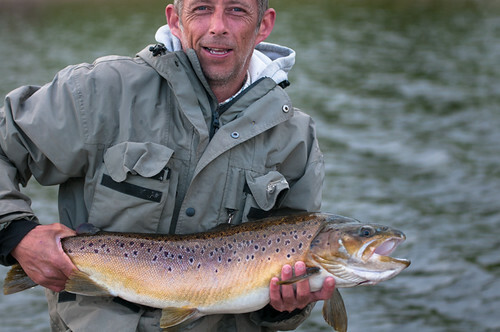 NOTABLE CATCH: Kenneth Horrocks-19 fish Ged Oxley 18 fish. BEST RAINBOW: 11lb 8oz for Gary Priest. BEST BROWN: 3lb 12oz for Graham Semple. BANK ROD AV: 12 fish per angler! BOAT ROD AV: 3.46 fish per angler. SPORT: There were some heavy showers here today but when it wasn’t raining the sun made an appearance. I think the weather put a lot of bank anglers off today but those that fished caught some good fish. Fishing on Bell point was Mick Ashworth who caught 6 trout. Mick caught all his fish on a half day ticket and found a coral booby on a sinking line to be his best tactic. Also fishing the bank around Bell point was Ged Oxley who caught 18 trout. Like Mick he also found his best tactic to be a coral booby on a sinking line. Today we hosted the annual Lancashire fire and rescue service fly fishing competition with 32 boat anglers competing. Between them they caught 111 trout. They found fish in all areas of the reservoir including the northern shallows and Hollins bay. After a highly competitive match the results were in and the winner with a super haul of 19 trout was announced as Kenneth Horrocks. In second place was Dave Vose with 8 fish and just 1 fish behind in third place was Charlie Gault. Well done to all competing anglers and many thanks to Lancashire fire and rescue service who continue to support us. Out of the competition Gary Priest had a good half day session landing 6 fish from around gull island including the best fish of the day, a super 11lb 8oz rainbow that fell to a hot head damsel. I see no reason why good catches should not continue. See you on the water Paul. This entry was posted in Stocks Reservoir Fishing Reports on April 26, 2012 by Ben Dobson. BOAT ROD AV: 6.71 fish per angler. This entry was posted in Stocks Reservoir Fishing Reports on April 25, 2012 by Ben Dobson.